I'm Yours is another of those wonderful Duke/ Peacock 45s that I love to death. Typically brassy “big band” arrangement from the great Joe Scott over a Latin tinged beat. 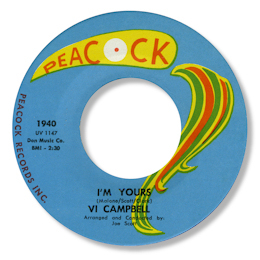 And over all that Vi Campbell sings her heart out – lovely tough tone to her voice. The flip is of interest to Northern soul fans. 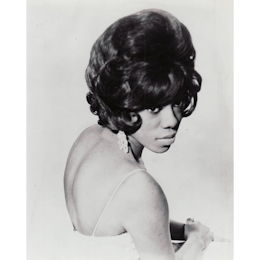 Vi also appears on Bobby Bland’s excellent Dear Bobby (The Note) playing the role of the sultry female writer. She was a member of Bland’s Revue for a number of years in the 60s. Vi is also a “suspect” as the female voice partnering O V Wright on “How Long Baby” but to my knowledge this hasn’t been confirmed yet.
" A few days ago I was browsing through an old Blues & Soul magazine. Issue 158 from April 1975 to be precise. In the magazine there was an article on OV Wright written by Derek Howe, who back in '75 was "Singles Manager and Assistant in Charge of Soul Music at Manchester's HMV shop". The article was an excellent run through of OV Wright's, then, career to date. In the article in the section listing Wright's Backbeat releases Derek states: ""Poor Boy" was followed by an excellent ballad "Gone For Good" the B side of which "How Long Baby" featured a duet with his wife (Emily?)." I notice a question mark appeared in the statement but appears to be merely questioning the name of the lady, that it was Wright's wife did not appear to be in doubt. At OVWright.org there is a comment from an old friend - Johnny Rawls - that confirms that Emily was OV's first wife's name. So perhaps the question is answered. It of course opens up another question: did Emily appear on any other recordings, either solo, or perhaps as part of a group or backing group?" I'm grateful to Dave for getting to the bottom of this one - and of course to Derek Howe as well.